Justice for James Rivera; Police Murder in Stockton, Ca. On July 22, 2010, 16 year old James Earl Rivera, Jr. was shot and killed in a hail of 48 bullits fired by Stockton PD Officers, Gregory Nunn and Eriz Azavard and San Joaquin County Sheriff Deputy John Nesbit. Unarmed James Rivera was driving at normal speed to his home when he was rammed and turned around by a Stockton police car. A second police car rammed him again, pushing him through two neighboring garages and immobilizing his car. Witnesses at the scene say the crash through the garages would have easily injured James seriously. The three officers exited their vehicles and positioning themselves on both sides and behind (the seriously injured) James, opened fire with 48 rounds from 2 (9mm) handguns and a AR-15 Army Assault rifle. 19 of the 48 bullits hit the 16 year old Black youth on both sides of his body and in the back of his head. His mother followed the ambulance to the hospital and was threatened by police dogs and forced out of the hospital when she demanded to see her sons body. Two years after the brutal assassination style killing of James Rivera, the police have still not released a report to the family. 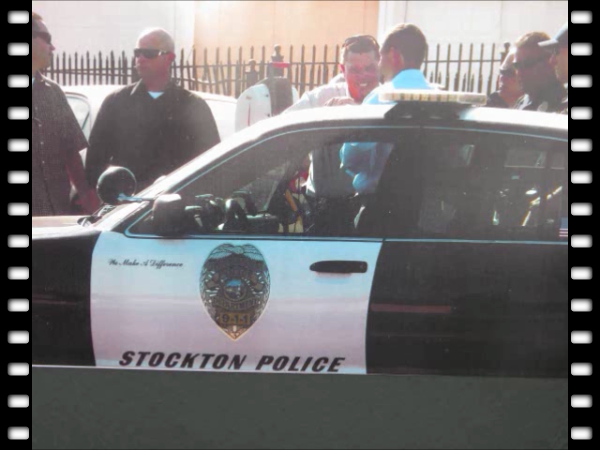 Witnesses have stated that James was stopped by Stockton police and let go minutes before he was killed. Police claimed they shot Rivera because they thought he would back his car up and was a threat to them. It is clear from pictures of the crime scene that it was impossible for James' car to move. In fact, police had to use a tow truck to pull James car over the debris of the crash and out of the garage. This video contains disturbing images of the deceased after being rammed through two garages and shot 19 times. View with discretion. In this video, both parents appeal to their communities to stand up against police brutality before their loved ones are killed.